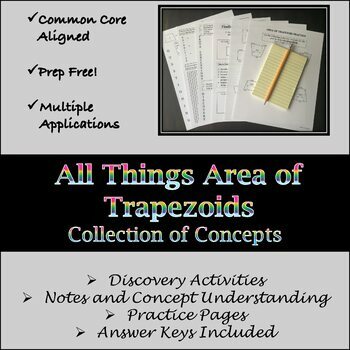 Feel prepared in introducing the area of trapezoids! This collection of concepts and activities is student centered and encourages student questioning and discovery. Application of prerequisite knowledge is required in order to develop a meaningful formula for area of a trapezoid. Components are designed to evoke valuable student to student interactions and discourse, as well, question lead discovery. Let them WONDER and be AMAZED by where they go! !